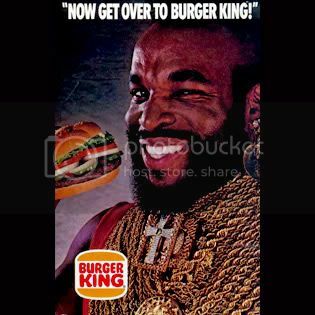 Yeah, so to start with, for month I've been saying I want to be the "Burger King" for Halloween. Well, not anymore. Look to see how much the outfit on EBAY. Ughhh, it's been a few months now and I still can't get myself to talk about Mason Betha and G-Unit. I just can't understand it. Dude must be scared of the purple crew or something. Here's a link to what continues to confuse me. Remember Arrested Development comes back on the air November 7th. Please watch people, we can' let this show die. It's just too good. Any commercial that has a last line like this is worth it. Ok... since no one reads this... why do I even bother looking for links. I'm done here. I love ur page!I saw that commercial w/ the black kid...lol...it's so cute! I watched it like 5 times...Good Job on ur page! Love You!